You are here: Home / Weekly Columns / Opinion / Buy Nokia 8110 4G Banana Phone If You Want A ‘Dumb’ Phone. Buy Nokia 8110 4G Banana Phone If You Want A ‘Dumb’ Phone. (ThyBlackMan.com) The Nokia 8110 4G, also known as the Banana Phone, is HMD Global’s new Nokia phone which was launched in early 2018. It is a revival of the original Nokia 8110 which was famously featured in the film The Matrix. The Banana phone runs on KaiOS and supports Google apps like Assistant and Maps. Announced on February 25 at Mobile World Congress 2018 in Barcelona, the Nokia 8110 is a feature phone that supports 4G connectivity and a slider mechanism. Ideally, the phone is suitable for anyone who’s looking for a feature phone or trying to take a break from the endless stream of notifications on their smartphone. In simple words, the Nokia 8110 4G phone is a pure ‘dumb’ phone which is truly a not so smart feature phone. Available in black and yellow colors, the new Nokia 8110 Banana phone is powered by the Qualcomm 205 dual-core processor, 4GB internal storage capacity, and 512 MB of RAM. The device supports external storage through a microSD card with up to 32GB. You can expect the phone to last for 25 days on standby from a single charge and it can easily offer multi-day battery life even after heavy usage. In a time when smartphone users are concerned about screen addition, the Nokia 8110 comes as a breeze of positive change. The phone supports 4G but it’s not an Android phone which you can overload with multiple apps. The Nokia 8110 in its true sense is a dumb phone, thanks to the limited number of apps in the KaiOS store. Limited functions mean a significant cut down on how much time you spend on your mobile phone. The good (or maybe bad) news is that WhatsApp on Banana phone will become a reality. In July, KaiOS welcomed Whatsapp on its platform and HMD Global Chief Product Officer Juho Sarvikas couldn’t resist sharing the news. 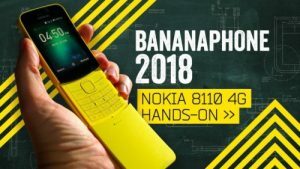 In his Twitter post about WhatsApp on KaiOS, he wrote “Looking forward to going Bananas” and made it very clear that WhatsApp will be available on the Nokia 8110 4G phone soon. More and more consumers around the world are looking for a less distracting mobile phone. The digital well-being trend is a hot thing and companies like Google and Apple have joined the bandwagon. If that is what you want from a mobile phone, the Nokia 8110 4G phone is a great option. The phone can significantly reduce the distractions by keeping notifications and alerts limited to calls and SMS, but there are some apps which you can use. Through KaiOS, you can use Facebook and Twitter on the Nokia 8110 phone. There’s a new version of Snake game available on the phone but that’s obviously not going to kill your time or distract you as long as you don’t launch that app because it’s a highly addictive game. Despite having support for multiple apps, the best thing about the Banana phone is that it only has 512MB of RAM. With that said, the operating system KaiOS is also a lightweight software that can handle limited applications with less number of features. It clearly means that you won’t stay glued to your mobile phone’s screen because there’s nothing much to do on this phone and it makes it a true ‘dumb’ phone many smartphone users look for. One thing that you may find annoying about the Banana phone is its slider. The classic Nokia 8110 became famous just because of this feature, but it is bit inconvenient that you have to slide the protective cover up and down just to do simple things like checking a message or using the keypad for small tasks. But the way it is used to receive and end calls makes the phone stand out and that much inconvenience is not too much. The Nokia 8110 is available for a price of €79 (nearly $97) and can be purchased online in some parts of the world.